Sony Gulf FZE, a subsidiary of Sony Corporation, today marked the dawn of a new era in the Kenyan market with the launch of its complete range of 3D-enabled products, offering consumers an immersive experience in 3D movies, music, sport and PlayStation® games. Sony’s 3D product range includes the BRAVIA LX900, HX800, NX815 and NX710 series – the new 3D LED HDTVs that build on the BRAVIA reputation for legendary picture quality, and the new 3D-enabled Blu-ray Disc player BDP-S470, as well as the 3D compatible Home Theatre Systems and channel sound bars including BDV-IZ1000, BDV-E970, HT-CT350 and HT-CT150 that have been specially designed to align with the 3D BRAVIA LED HDTVs. To complement this extensive 3D portfolio, Sony Gulf will also be rolling out a free firmware update for PlayStation 3 consoles, making the hardware 3D compatible to enable 3D gaming. In addition, the company already offers the Cyber-shot and the Alpha NEX-3 and NEX-5 digital cameras that can take stunning 3D panoramic shots. With the new range, Sony now offers consumers the most diverse and comprehensive line of 3D compatible home entertainment products including BRAVIA LED HDTVs, Blu-ray Disc players and home theatre systems, the PlayStation 3, Cyber-shot and Alpha digital still cameras with interchangeable lenses. 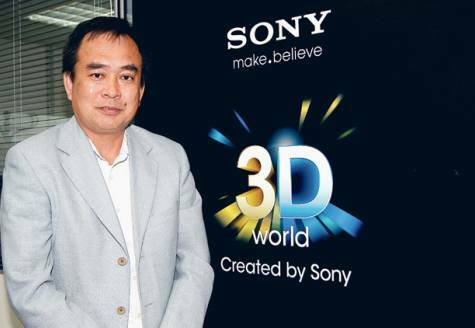 Osamu Miura, Managing Director, Sony Gulf, said: “3D technology in home entertainment is an immersive phenomenon. Unlike the 3D entertainment experiences of the past, which were characterised by objects coming towards the viewer, the emphasis has now shifted to adding an element of depth. Sony’s 3D world is about subtlety and detail, to totally engage the viewer. With its expertise in 3D from lens to the living room, Sony has assumed a leadership role in the research and development of the technology to drive its growth at every level – from supporting creators of content by providing them with custom-made professional equipment to influencing cable network operators into adopting systems that facilitate the relay of 3D content. “Due to our involvement in the development of original content and our efforts over the years to create ‘Good 3D’ content captured on Sony’s professional equipment, we believe this will translate into a superior and seamless visual experience on Sony’s entire range of 3D compatible products,” added Mr. Miura. A Monolithic design theme has been extended by Sony across its entire suite of home entertainment products launched in 2010. Apart from the new BRAVIA TVs, Sony’s Blu-ray Disc players and Home Cinema systems are all designed to create one seamless home entertainment experience, even in terms of design. Sony’s entire array of 3D products is currently available at all leading electronics outlets in Kenya.